Carson Wentz's status for the season opener is still up in the air. Doug Pederson arrived a few minutes late to his Tuesday news conference and joked, "I was meeting with the doctors" – a quip alluding to his unrest answering questions about Carson Wentz's status two days earlier. Jokes aside, Pederson will, in fact, meet with the medical/training staffs in the coming days. He said he will determine the Eagles' Week 1 starting quarterback on Friday, although he might not reveal whether Wentz can start in the season opener until 90 minutes before the game on Sept. 6. Whoever plays quarterback won't have No. 1 wide receiver Alshon Jeffery, who has not practiced since the Super Bowl while recovering from rotator cuff surgery. ESPN reported Tuesday that Jeffery will be out at least the first two weeks of the season. Pederson admitted he must tailor the game plan and the practice workload to one quarterback, which is why Friday is an important date. He said Wentz and Nick Foles have split practice reps evenly this week. 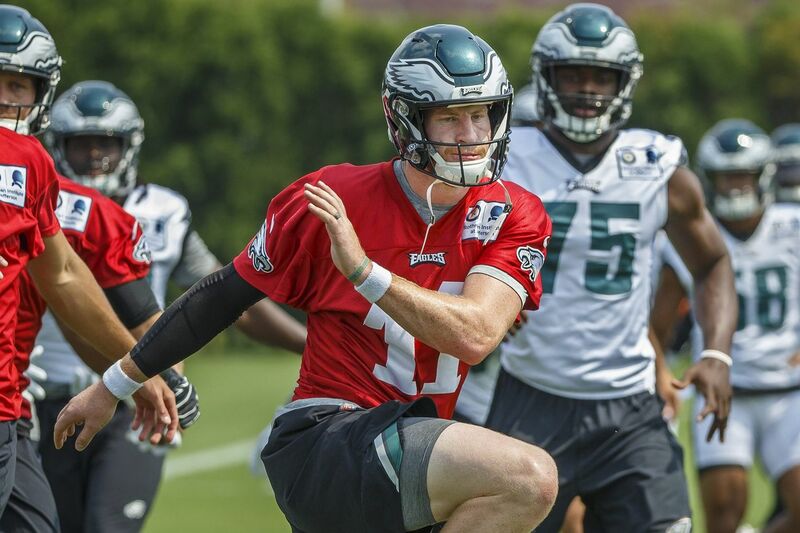 "When you get into the regular season and start game-planning," Pederson said, "whoever that gentleman is, [is] going … to take the full complement of reps."
Wentz's status will dominate the attention until kickoff, and rightfully so: He's the franchise quarterback. But he's not the only player Pederson must discuss with the medical and training staffs. The Eagles maintain an extensive injury report as the season opener nears, and it could have implications in the early season. Jeffery remains on the physically-unable-to-perform list. He attends every Eagles practice and has been working out with a trainer on a side field, showing more progress in recent days, but he has not participated in a practice session yet. He has increased his workload to catch about 75 passes a day. "We're just going to continue to monitor him and we'll see where he is at next week and make a decision," Pederson said in a news conference before ESPN reported the Jeffery news. "But right now, he's progressing well; we've just got to see his [progress] day by day." If the Eagles were to put Jeffery on the in-season PUP list this weekend, the receiver would have to sit at least the first six weeks of the season. That would seem unlikely considering that even if he misses the first two weeks, he could return to practice and games at any time in the first month of the season. ESPN reported that Jeffery will not be placed on PUP. Without Jeffery, the wide receivers will be undermanned early in the season. They received a boost when Nelson Agholor returned to practice this week after missing three weeks with a lower-body injury. But Mack Hollins, the No. 4 receiver, has missed practice all week with a lower-body injury. He has also missed the past two games and returned to practice only once since the preseason opener. "He's feeling good right now," Pederson said. "The rest has really helped him, and we should expect him back going into the regular season." The injuries at the position could affect how many wide receivers the Eagles keep on the 53-man roster. It could compel the Eagles to keep six receivers or pursue one in a trade or free agency. That would open an opportunity for players such as Markus Wheaton, DeAndre Carter, Greg Ward and Rashard Davis. Kamar Aiken is another established veteran at the position, although he has been sidelined with an injury, too. The Eagles also need to decide what to do at tight end because Richard Rodgers remains out with a knee injury suffered in the second preseason game. Pederson deemed the injury "week-to-week." Further complicating the situation is that Joshua Perkins is in the concussion protocol. That leaves Billy Brown and Cooper Sinclair as the other tight ends if the Eagles want to keep a fourth. They signed Anthony Denham on Tuesday; he was with the team last summer. Look for the Eagles to use two-tight end sets with Zach Ertz and Dallas Goedert often this season, especially while Jeffery is sidelined. When the Eagles assemble their 53-man roster, they'll need to have an idea how many players from each position will be healthy enough to make the 46-man game-day roster against the Falcons. "You've got to look at that and sort of forecast out what it's going to look like, what your 46 is going to look like that opening weekend," Pederson said. "We've been in this situation before with injury, so it's no different. We've just got to make sure that everybody is prepared and coaches are on top of their positions and we have the 46 ready to go." >> READ MORE: Eagles will be stronger with Brandon Graham, but will he be ready? Another injury situation that the Eagles must monitor is to running back Jay Ajayi, who has missed the last two weeks of practice with what Pederson termed a "lower-body injury." Pederson said it's "just rest" and that "we're trying to get him ready for the regular season." The good news at running back is that Corey Clement returned to practice this week after missing two weeks with an ankle injury and Darren Sproles will play in the season opener. Donnel Pumphrey, who has missed the whole preseason with a hamstring injury, will be ready to play on Thursday in his lone audition this summer. The Eagles are expected to give rookie Josh Adams a heavy workload. The injuries are not as much a problem on defense. Brandon Graham is practicing while working his way back after offseason ankle surgery. He said Monday he's about 80 percent of full strength and how he feels next week will determine how much he plays in the opener. Pederson said Graham is fresher than the other defensive linemen because he hasn't played as much this summer. Defensive tackle Tim Jernigan remains on the non-football injury list with a back injury and is not expected to be ready to begin the season. The same is true for safety Chris Maragos, who is on the PUP list with a knee injury. Both will likely miss at least the first six weeks of the season.